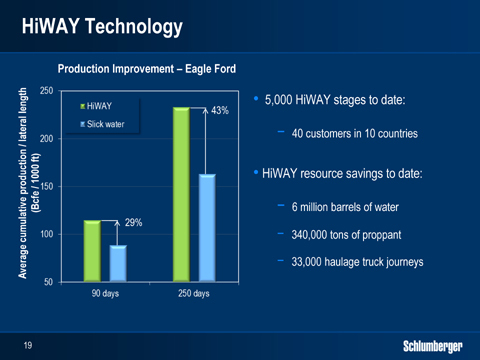 Schlumberger's Hiway Flow Channel Hydraulic Fracturing increases production by 20%, reduces water use by up to 60%, and reduces proppant (sand, fibre, chemicals etc) by 40%. All of this adds up to significantly lower expense per unit of production, making tight oil & gas production more economical. [Besides Hiway,] Schlumberger and other innovators are also using sophisticated seismic techniques, combined with data from pilot wells, to reduce the number of fracks along a drill pipe and target only the "sweet spots" in the field. Together, these new techniques and smart rugged sensor kit from National Instruments can also reduce the production pace variability that plagues the unconventional industry. And according to one senior executive at one of the world's major oil companies, these cost-saving innovations may only be the beginning. Oilfield services company Schlumberger has devised a new fracking system called "Hiway" which promises to slash the costs of tight gas production. So how does Hiway work? Hodenfield, who grew up in North Dakota where the Bakken field is at the centre of the U.S. shale gas boom, brightens at the opportunity to explain a process that adds a proprietary fiber to the traditional sand and fluid mix, and uses a "pulsing" system to send globs of the fiber in between each injection. The dissolvable fiber globs create more effective channels for the gas to flow, and the pulsing rhythm can be made to match the geological structure of the rock, also pushing the sand deeper into the cracks and resulting in more effective openings that conduct gas better for every liter pumped in. Hiway is not the only new technique on the scene as oil companies look to use fracking to reach more lucrative oil as well as gas. Schlumberger and other innovators are also using sophisticated seismic techniques, combined with data from pilot wells, to reduce the number of fracks along a drill pipe and target only the "sweet spots" in the field. "It's mostly brute force up to now," he said. "When the oil majors get serious about investment in fracking the cost could fall by half." U.S. fracking expenditure is not pocket change. Hodenfield cites data from analysts Spears & Associates saying the total onshore oil and gas industry drilling and completions spend, boosted mainly by unconventional work, has soared to $150 billion a year from $20 billion in 2002. This eclipses the offshore spend, which was at a similar $20 billion level 10 years ago and has only recently recovered to that level after the Macondo oil spill disaster of 2010. Tight oil & gas is not an infinite source of hydrocarbon energy, but it is a truly massive resource --- particularly on a global scale. While vast conventional oil & gas resources remain to be discovered, the same is doubly true for unconventional hydrocarbons. This is because up until now, exploration has not focused upon the unconventional resources. Due to an increasing ability to produce this resource more economically, more exploration will take place looking specifically for unconventional deposits.